The Bulls returned to Utah for Game 6 on June 14, 1998 leading the series 3–2. 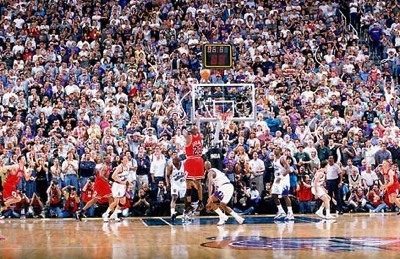 Jordan executed a series of plays, considered to be one of the greatest clutch performances in NBA Finals history. With the Bulls trailing 86–83 with 40 seconds remaining, coach Jackson called a timeout. When play resumed, Jordan received the inbound pass, drove to the basket, and hit a layup over several Jazz defenders. The Jazz brought the ball upcourt and passed the ball to forward Karl Malone, who was set up in the low post and was being guarded by Rodman. Malone jostled with Rodman and caught the pass, but Jordan cut behind him and swatted the ball out of his hands for a steal. Jordan then slowly dribbled upcourt and paused at the top of the key, eyeing his defender, Jazz guard Bryon Russell. With fewer than 10 seconds remaining, Jordan started to dribble right, then crossed over to his left, possibly pushing off Russell, although the officials did not call a foul. Jordan then released a shot that would be rebroadcast innumerable times in years to come. As the shot found the net, announcer Bob Costas shouted "Chicago with the lead!" After a desperation three-point shot by John Stockton missed, Jordan and the Bulls claimed their sixth NBA championship, and secured a second three-peat. Once again, Jordan was voted the Finals MVP, having led all scorers by averaging 33.5 points per game, including 45 in the deciding Game 6. Jordan's six Finals MVPs is a record; Shaquille O'Neal, Magic Johnson, and Tim Duncan are tied for second place with three apiece. The 1998 Finals holds the highest television rating of any Finals series in history, and Game 6 holds the highest television rating of any game in NBA history. Michael Jordan is often referred to as the best player to play the game. He is a 5 time NBA MVP and 6 time NBA finals MVP. Michael Jordan played his last game with the bulls in Game 6 of the 1998 NBA Finals at the Delta Center, the Chicago Bulls led the series 3-2, but trailed the game 86-85 with 10 seconds left. Jordan started to dribble right, then crossed over to his left. Jordan then released a shot that would be rebroadcast innumerable times in years to come.